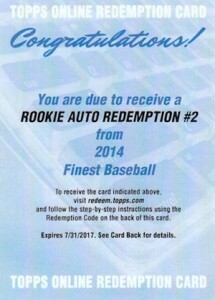 As they had done in 2013, 2014 Topps Finest Baseball included three mystery redemptions for rookie autographed cards. After months of uncertainty, Topps has revealed the subjects for these cards. One name may immediately jump out to collectors because he has not been a rookie for some time. The Sandy Koufax autographed card honors the upcoming 60th anniversary of his 1955 Topps rookie card. The commemorative card will feature the design of his 1955 card on Chrome technology. While they may not carry the same hype as other names that were speculated, two current rookies complete the checklist. Jacob deGrom has shown considerable ability as a rookie pitcher for the New York Mets. Kenny Vargas got his call up to the Minnesota Twins in August, but is already hitting like a seasoned veteran. Based on the initial solicitation, the cards were to be each numbered out of 100, but that was not confirmed on the press release. We will touch base with Topps and update the article if that print run changes.